The 32 metre motor yacht Indigo, listed for sale by Philip Bell at Northrop & Johnson, has been sold with Yachtzoo introducing the buyer. Indigo was built in steel and aluminium by Italian yard CBI Navi to Lloyd's class standards. 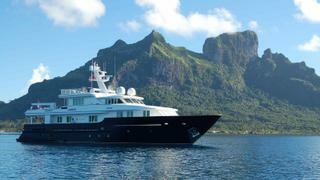 Designed by Luca Dini, she was delivered in 1998 as a pocket explorer yacht. Her stunning interior features high gloss maple joinery matched with light coloured soft goods and marble throughout. Accommodation is for six guests in three staterooms and a crew of up to six people split across three crew cabins. The guest staterooms consist of a master suite, VIP suite and a twin cabin, all with en-suite bathroom facilities. Refitted in 2013, Indigo has been maintained to the highest standards and remains in Lloyd's class. With a range of 4,000 nautical miles at 12 knots courtesy of twin 700hp Lugger engines, she has proven her world-girdling capability following a successful circumnavigation. An Atlas Power Management Systems convertor allows her to plug in anywhere in the world. Indigo was asking $3.3 million.